A bookmark is used to assign a name to a position or an area in a document so it can be referred to from elsewhere, e.g. in cross-references or macro code. You can manually add bookmarks via the Ribbon tab Insert > Bookmark. Word also automatically adds bookmarks in some situations, e.g. when generating a table of contents. If a document contains many bookmarks, you may wish to get an overview of all the bookmarks and any contents enclosed in the bookmarks in one place. Here you will find link to a free Word add-in that lets you extract / export all the bookmark data to a new document. 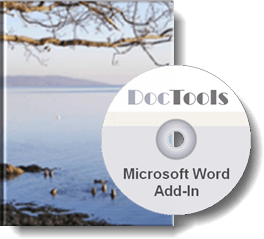 DocTools ExtractData is a Word add-in I provide for free. It lets you extract acronyms, bookmarks, tracked changes and comments. The extracted data, incl. additional metadata, will be listed in a table for easy overview. DocTools ExtractData adds a set of tools to a custom tab, DocTools, in the Ribbon. The tools can be accessed from the group Extract Data in the DocTools tab. The DocTools tab may also contain tools from other add-ins provided by DocTools. The result of extracting acronyms, tracked changes and comments are slightly improved versions of the results you get by using the free macros available on this website. The functionality for extracting bookmarks is available in the add-in only. Click the button below to learn more about DocTools ExtractData. You can download the add-in for free. For a macro that can extract tracked changes from the active document, see Extract Tracked Changes to New Document. For a macro that can extract all comments from the active document, see Extract Comments to New Document. For a macro that can extract ACRONYMS from the active document, see Extract ACRONYMS to New Document.